The other morning I was knee-deep in making the kids’ lunches, when I suddenly realized that it was almost time to leave AND I hadn’t yet made my own lunch. It was as if the anvil of getting the kids to school on time was about to fall on my head. In that cartoon-like moment (imagine the seconds before the metal lands on Wile E. Coyote, and just guess who the super genius is in this case) I was struck by inspiration–If I’m cutting up an apple for Pinta’s lunch, why not cut one up for my own? Typically, for my lunch I’ll throw together some grilled chicken breasts, some goat cheese, and some bread. And when I say “throw together,” I’m not kidding. I toss all those things in a bag and then assemble them at my desk at work. This leaves me with a decent, but less-than-inspired lunch. The day of my Newtonian moment, I took the apple slices I’d cut and threw those in the bag, too. When I assembled that at my desk, I had a pretty smart looking sandwich. All of this is to say: Don't give up. Just keep cooking and things will be fine. You might suprrise yourself. Some things just get better with time. I had a chance to reflect on this during Father’s Day. I wasn’t thinking about my skills as parent, but, rather, a week-old chicken I had lingering in the fridge. On Father’s Day, I had planned to take it easy around the kitchen. On a typical Sunday, I’m busy cooking about three things at time for the coming week. They could be anything from quinoa salad, to black beans, to Bolognese sauce. This Sunday, though, I wanted to relax. Santa Maria helped in many ways. She made two fantastically rich and delicious Dutch babies for breakfast, and she took the family out for dinner. For lunch, she and I had chicken-rice soup that I made that morning. For try as I might, I can’t stay out the kitchen. There's always something that pulls me back into it. I had fallen behind in cooking last week and ended up with an extra chicken that was getting past its sell-by date. I’m embarrassed to say that I didn’t have room for it in my freezer, and I just left it in the fridge. It started to get a bit stinky, and I new the only way I could salvage it would be to make soup. There’s something about an old chicken that makes chicken soup even more delicious, so I knew I wouldn’t be doing any harm by letting that bird molder a bit. Sure enough, when I cooked up that soup, it was rich and delicious. Put the rice on to cook. Add a bay leaf or two and salt if desired. Heat some olive oil in a tall stock pot. Add the onions, carrots, and celery. Saute until the garlic is soft. Rinse and add the whole chicken to the pot. Add enough water to the pot to cover the chicken. Add the bay leaves, lemon halves and juice, and other spices. Cook for about an hour, or until the chicken is cooked through. Remove the chicken with a slotted spoon. Remove the lemon halves, chili pepper, and bay leaves. Pick the meat from the chicken and return to the soup. Notes: Remove the chili pepper earlier if you want the soup less spicy. The soup freezes well. We’ve been lucky this winter, and none of us have been sick, but the bill for our good fortune just came due. Nina vomited last Thursday. Pinta had a stomachache on Friday. Santa Maria was waylaid with a fever and congestion, and then all hozzawatza-broke loose Saturday night when most everyone was very ill. I say most everyone, because, fingers-crossed, I seem to have escaped the worst of it. Or have I? I’m not sure. There’s a scene in the “Fantastic Mr. Fox,” which we watched Sunday afternoon while convalescing, in which the Fox and his family and all the other animals are flooded out of the tunnel in which they’ve been hiding. As the scene unfolds, you wonder—will they make it out alive? I feel a bit the same way, wondering: will that norovirus or whatever the hozzawatza has been wrecking havoc on my family have a turn with me? One of the go-to weekend lunches around the Stay at Stove Dad household is the old grilled cheese. I love them because they’re quick and easy, and my girls love them because, well, who doesn’t love a grilled cheese. They like them open faced, with cheddar, and it takes about ten minutes (sometimes less) under the broiler to get them finished. Do you really want me to tell you how? Okay, I will: lay the bread on a cookie sheet, put slices of cheddar on top, and run under the broiler until melted. There, you’re done. You could probably cook it faster than it takes to read this post. Sometimes, I’ll play around a bit with the grilled cheese, and Nina will ask for a Croque-Monsieur. She had one a while back at my workplace cafeteria, and she loves them. The version I make is a bit of a lie. It’s more a poor-man’s Croque Monsieur than anything else, but she still likes it. I basically make a closed-faced grilled cheese and put some frizzled ham (ham that I’ve fried up in a pan) in the center of it. I used to make it with Gruyère, but I’ve since started economizing, and have resorted to using cheddar. A true Croque-Monsieur is a thing of beauty. A crunchy, savory, and succulent sandwich. It's mouthwatering. Am I using too many adjectives? I wonder, but writing this entry is making me hungry for one right now, and while hunger may be a good seasoning, it’s not exactly an aid to thinking or writing. Today, the Croque-Monsier is a bit more elaborate. Ina Garten, of the Food Network, has a tasty recipe here, and the online recipe site Epicurious has one here. They both involve making sauces, and with two kids running around that’s kind of a far-fetched idea for me. But you might feel differently. And if you’re looking for ways to spice up a plain, old grilled cheese, last month’s Food Network Magazine had fifty different ways to do so. Sometimes cooking can be so easy that it boggles my mind. Take tonight’s dinner, for example. I simply brought together something from a new recipe and added it to an old recipe, and voila, I had a smashing new dish. Okay, it wasn’t completely, 100% new, but, then again, what actually is new? Is anything? I took the crispy Chorizo sausage from my friend Aran Goyoaga’s sublime Brussels sprouts, sausage, pear, and black quinoa salad, and added it to my sturdy old sweet potato and quinoa salad. It was that easy. The result was satisfying and delicious. I’ve always liked my quinoa salad, but I often felt it didn’t have enough heft. The Chorizo solved that problem on two accounts. It added a touch of spice and it added a huge hit of protein. Easy, I’m telling you. Go try it, and see for yourself. You’ll be happy you did. Cook the quinoa in 2 cups of water as you would cook rice, about twenty minutes. Set aside to cool. Cut the Chorizo sausages in half lengthwise, and then cut into ¼ inch thick half moons. Add a little bit of oil to a large frying pan over a medium-high heat and crisp up the sausages on one side. Flip and crisp on the other. Drain on paper towels and set aside. Chop the sweet potatoes into small squares, about a half inch each. Coat with a tiny bit of olive oil, salt and pepper, and spread out on a baking sheet or in a large frying pan and roast in the oven until the potatoes are soft on the inside and slightly crispy on the outside, about twenty to twenty-five minutes. Toss all the ingredients, including the sausages, and dress with the oil and vinegar. Notes: Dress only as much of the salad as you would like to eat in a given sitting. The remainder of the salad will keep for days, so long as it is not dressed before consuming. *Crisp up only as much Chorizo as you might like to consume in that setting. Figure one to two sausages per person (though that’s what I eat, and I eat a lot more than most folks). This recipe makes about five to eight servings of the salad, depending on how large each serving is. Just keep in mind that it makes a lot of salad. One of the benefits of making meals for the family on a regular basis is that cooking begets cooking. What does that mean? Simply, the more you do it, the easier it becomes. You start to see ways to combine things and make old things new again. Take the my recent infatuation with Chorizo, the Spanish pork sausage. As I mentioned earlier in the week, I've been using it to transform various dishes. Here's the latest way. Over the weekend, I needed a quick, no-hands lunch for myself. Santa Maria was out of town and I was on my own with the kids. I copped out and gave them canned lentil soup. Not the best thing in the world, but not the worst, either. I knew I had some lentil-bulgur soup in the freezer (that's the benefit of keeping a regular cooking schedule). It is one of my favorite soups, but it has an Achilles' heel: It doesn't have enough protein for me. I fixed that problem once before, with Andouille sausage, and I knew I could do it again, with the last bit of Chorizo I had in the fridge. As with the other recipes, I cut the sausage in half-moon shapes, crisped them up nicely, and then put them atop the soup. It was super delicious. Rinse the lentils and bring them to a boil in the salted water or stock. Reduce heat to a simmer and cook, covered, for about forty minutes. While the lentils are cooking, heat the olive oil in a heavy soup pot and saute the onions until they are translucent. Add the garlic, cayenne, bay leaves, and bulgur. Stir, until the onions and bulgur are lightly browned. Mix in the tomatoes and parsley. Pour the cooked lentils into the pot. Add the tomato paste and rosemary. Simmer for another 15 minutes or so; until the lentils are tender. If the soup looks too dry, add some boiling water or hot stock. Note: you can also stir in fresh spinach and let it wilt in the soup first, for a completely nutritious meal. And this recipe makes a large quantity of soup; adjust the amount of sausage accordingly. Starting with Santa Maria’s party last week, I’ve been on a great run in the kitchen. That gumbo I made for that gathering was so remarkable, I’m still a bit stunned from it. There hasn’t been a flavor like it in the house before or since. The party was so jumping, that I forgot to take a picture of the finished dish (that’s one of my failings as a food blogger, I tend to get too excited about eating to stop and photograph my meal). 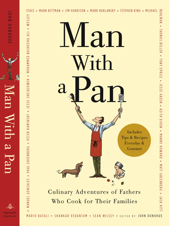 I don’t have time right now to do that gumbo justice, but I promise I will share that recipe with you very shortly (If you can’t wait, just go to page 202 of “Man with a Pan,” which is where I got the recipe in the first place). This morning, I doubled down and made a chili—using a hand-scribbled recipe from my earliest days in the kitchen, well before kids, this blog, and “Man with a Pan.” I also relied on a distinct memory of smoky Spanish paprika, which makes all the difference in the world in that dish. I’ll have more about the chili soon, too. I want to put off talking about those bigger meals because I want to take it easy tonight. Today, I realized that to survive as a parent and spouse I need to behave like a shark, and always keep moving (I made that chili, cooked pancakes, drew three cartoons, cleaned and put into storage three air conditioners, washed all our sheets, towels, and dirty clothes, went for a run, cooked spaghetti alle vongole for dinner, and put the kids to bed)—so I’ll just talk about my lunch. Santa Maria took the kids out of the house this morning on a long excursion, so I could have time to do some drawing, so I made a simple meal for myself. I had a bit of cooked chicken left over from earlier in the week (I’ve gotten in the habit of roasting an extra bird each week, and using it to make lunches and dinners), and I thought a chicken salad would be nice. I diced a stalk of celery, cut up a scallion, and chopped some fresh parsley. We don’t keep mayonnaise in the house, for reasons I’ve long forgotten (something to do with Santa Maria not liking it, and me having little or no use for it), but I needed something to bind the chicken with the other ingredients. I briefly contemplated making my own mayonnaise, but after getting the blender out, decided against it—I might want to be a shark, but I don’t want to be a crazy one: I had enough to do around the house as it was—and I simply whipped together fresh lemon juice and olive oil. I added a bit of feta and some black pepper, and placed it on freshly toasted rye bread. It was just the thing I needed. ½ lb. diced cooked chicken meat (ideally leftovers), and this amount can vary; adjust other seasonings accordingly. Combine in a bowl all the ingredients save for the olive oil and lemon juice. Whisk together the lemon juice and the olive oil, and pour over the salad, and stir. Add pepper, and maybe salt, depending on how salty your feta cheese is. Serve the salad on the toast and eat immediately.